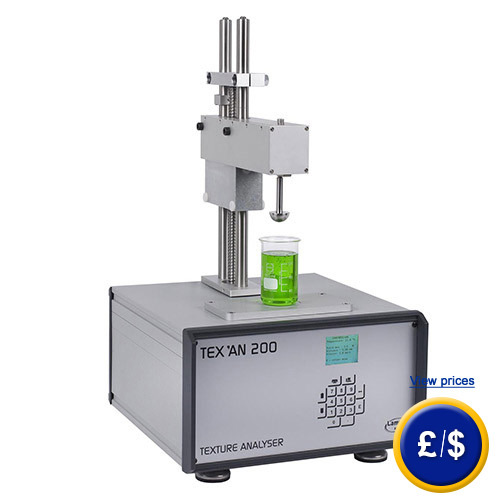 The texture analyzer TEX AN 200 is a checking device to determine the physical characteristics of various materials. 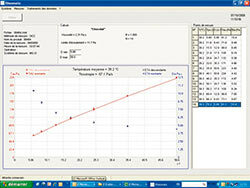 By means of the texture analyzer TEX AN 200 among others solidity, elasticity and the adhesion can be determined. Therefore a sample is to be loaded via the texture analyzer in various mechanical ways. 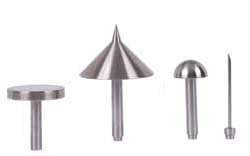 The texture analyzer is equipped with a variety of test pieces . For the analysis force and the path are to be recorded. The texture analyzer TEX AN 200 is applicable in different areas of industry, pharmacy and food industry and by that it helps achieving in the field of research and development repeatable checking procedures. The display of the texture analyzer TEX AN 200 shows thereby the maximum force Fmax, the minimum force Fmin, the force F at a previously defined time and the current value. Furthermore there is the possibility at the texture analyzer to select between the units N , g and kg. The texture analyzer stores the last 20 values. Via a RS232 interface the data can be stored on a computer and be transferred via a TEX AN-DRIVE software. The TEX AN DRIVE software of the texture analyzer furthermore allows defining the test parameter (speed, distance...), the display parameter, the desired calculation (surface, gradient, rate...) and thus the complete procedure can be saved. If there are any questions about this texture analyzer TEX AN 200, please have a look at the technical specification below or call: UK customers +44(0) 23 809 870 30 / US customers +1-410-387-7703. Our technicians and engineers will gladly advise you in all texture analyzers and all products in the field of measuring instruments, regulation and control and scales. By means of the software the data can be transferred through a RS232 interface from the texture analyzer TEX AN 200 to a computer. Furthermore the software TEX AN DRIVE allows defining the test parameter (speed, distance,...), the display parameters, the acquired calculation (surface, aptitude, ratio...) and thus the whole procedure and test specifications can be saved.